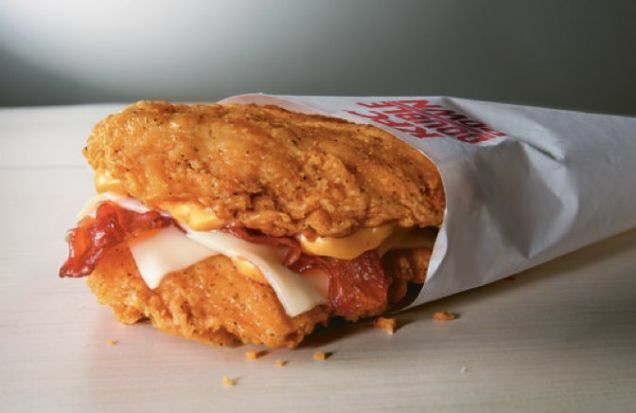 In recognition of America's insatiable craving for chicken, chicken-like food products, and Frankenfoods, KFC is resurrecting its stomach-turning bunless chicken sandwich, the Double Down. The monster was first introduced in 2010, but its availability in the U.S. has been limited over the past few years. KFC's parent company, Yum! 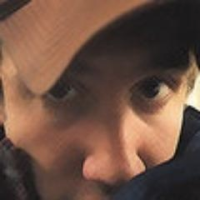 Brands, apparently ran out of ideas for weird things it could dare Americans to eat after unleashing a pizza crust made of cheeseburgers, the Taco Bell waffle taco, and the fried chicken corsage (hashtag #prom). Besides, they're honor-bound to fire back after Domino's launched a pizza with chicken instead of crust this week. The Double Down will be back April 21, at which point you will be bombarded with a "Double Down Dare" campaign as Yum! executives feast on actual food cooked over a pile of burning money and give each other high fives.